Join us these school holidays for 2 exciting workshops! Dance Magic – 3 hours of dancing and activities! Explore 3 dance genres – Ballet, Lyrical and Jazz. Extra Gratuity – we are offering working families the flexibility to drop their child off from 8:15am to ensure you can get to work on time and also allow an extra 30 minutes at the end of the session for pick up. This is offered at no extra charge but places are limited, so book in quick. 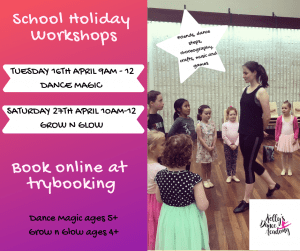 Grow N Glow – Your child will gain a boost of confidence boost in this 2 hour workshop filled with dance and drama activities.